The Snow Joe iON21SB-PRO 21-Inch Cordless Single Stage Snow Blower comes with a 600 watt brush less motor and interchangeable lithium ion batteries. It will clear up to 21 inches wide and 8 inches deep snow. However in hard packed snow conditions some customers found that it could not handle this type of snow. Many found that the snow blower rode up on the snow. Lots of patience was required. Description: The Snow Joe iON21SB-PRO 21-Inch Cordless Single Stage Snow Blower weighs only 36 pounds. It is relatively light and can easily be transported in your car’s trunk. Batteries are interchangeable. There is a powered LED light. A switch immediately starts the machine. No oil, gasoline or noxious fumes are needed or produced making this machine environmentally friendly. 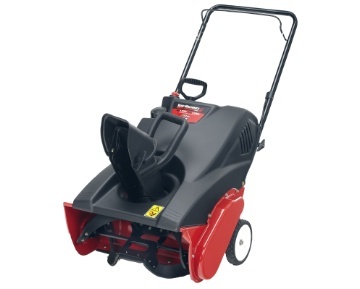 Summary Seventy six percent of customers rated this snow blower a 4 or 5 out of 5. The remaining rated the snow blower 3 or less. Customers wrote that as long as you are patient, this snow blower will easily move lots of snow. It works best with 8 inches of snow or less. However it will also handle more than that if you take your time. Some customers found that because the snow blower is so light, it rides up over the snow. It also stops when the snow is hard packed. Compared to a heavier gas power model it just did not have the power or the weight to handle all kinds of snow conditions. 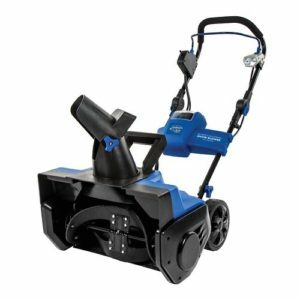 Description: The Snow Joe SJ624E Electric Snow Thrower 21-Inch clears 21 inches wide and 11.8 inches deep snow in conditions where the snow is light and fluffy. Heavy wet snow presents a challenge for this snow blower(see review summary). It comes with a 14 amp motor. It must be plugged in to an electrical outlet at all times. The benefit of this snow blower is that it does not require gasoline, oil or tune-ups. The chute can be rotated 180 degrees. This is a single stage snow blower. The auger is made of steel with rubber blades to scrape and clear the snow. The snow blower weighs 34 pounds and can be hung on the wall while being stored provided that you have suitable supports to handle the weight. 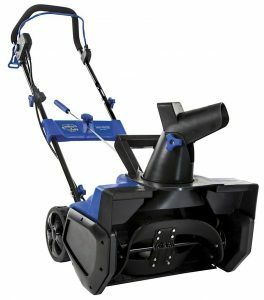 The Snow Joe SJ624E Electric Snow Thrower 21-Inch had 47 reviews at the time of preparing this review with an average rating of 4.1. Customer complaints ranged from poor quality, assembly and sturdiness to the usual unmet expectations for snow clearing. Consumers found that in heavy snow conditions i,e, wet snow, icy snow or drifted snow, this snow blower was just not powerful enough. Consumers should really evaluate the type of snow clearing they need to do each year. If you get a lot of snow or snow that is heavy and wet, the Snow Joe SJ624E Electric Snow Thrower 21-Inch may not be able to do the job. The Yard Machine Snow Thrower 2M1A is a small snow thrower that is suitable for light snow clearing. With only a 10 inch height intake and rubberized auger that is self pulling, it really is not meant for heavy-duty snow clearing. This is for small areas and relatively light snow falls. It is small and the handles fold for storage. Most people will find that this snow thrower is good for fresh snow that is not too deep on sidewalks and small driveways. You will struggle with one of these machines on any thing else. Trying to push a snow thrower like this one is a lot of work if you have drifted snow conditions, wet snow conditions or icy conditions. Compacted snow at the end of your driveway pushed there by the snow plow will also be difficult to deal with. You will need to use a regular shovel for this kind of snow or obtain a larger heavier machine. Arctic tested high-impact 5” polymer chute: won’t rust, dent or crack! Most customers will have to arrange for delivery of their new snow blowers. However this snow thrower is small enough to fit in the trunk of most cars or SUV’s. You can have it delivered, however there would be a charge for delivery. Most snow blowers can be purchased with tire chains to provide extra traction in icy situations. In addition, snow shields are also a good idea if you want to protect yourself from windy conditions. Also snow being blown back at you from the wind. This seems like an obvious thing but people still do it and are hurt, sometimes badly, every year. Always turn it off before you do any maintenance, add fuel, check the oil, fix the chains on the tires, or clear the augers of snow. Clearing Snow from the Augers – this is were lots of people are hurt every year. Before you try to clear snow that is plugging the augers, shut the engine off to avoid sudden turning of the augers or the impeller which could cause lots of damage to fingers, hands and arms.